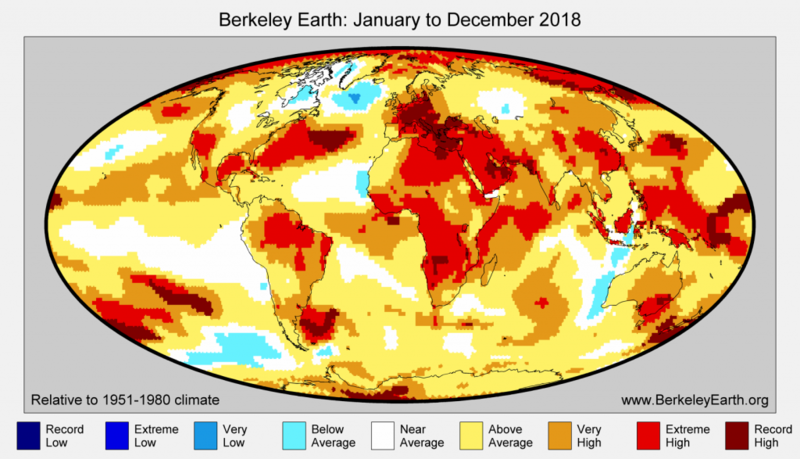 Berkeley Earth, a California-based non-profit research organization, has been preparing independent analyses of global mean temperature changes since 2013. The following is our report on global mean temperature during 2018. We conclude that 2018 was likely the fourth warmest year on Earth since 1850. Global mean temperature in 2018 was colder than 2015, 2016, and 2017, but warmer than every previously observed year prior to 2015. Consequently, 2016 remains the warmest year in the period of historical observations. The slight decline in 2018 is likely to reflect short-term natural variability, but the overall pattern remains consistent with a long-term trend towards global warming. Uncertainties indicate 95% confidence range. In our estimation, temperatures in 2018 were around 1.16 °C (2.09 °F) above the average temperature of the late 19th century, from 1850-1900, a period often used as a pre-industrial baseline for global temperature targets. 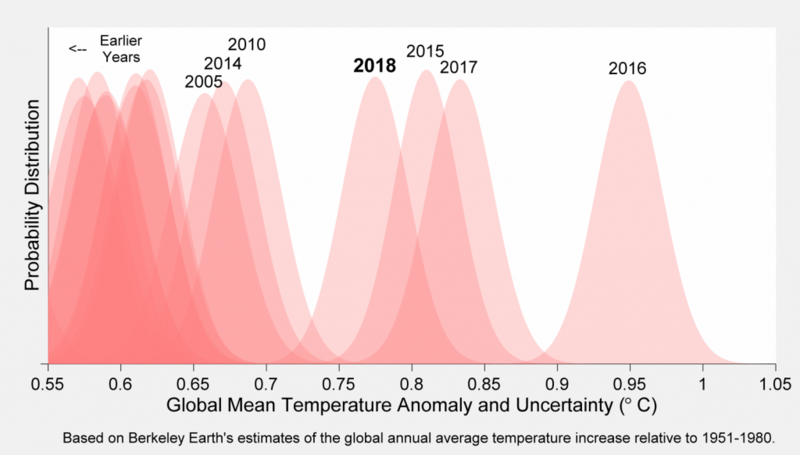 The temperature uncertainties can be visualized using the schematic below where each year’s temperature estimate is represented by a distribution reflecting its uncertainty. 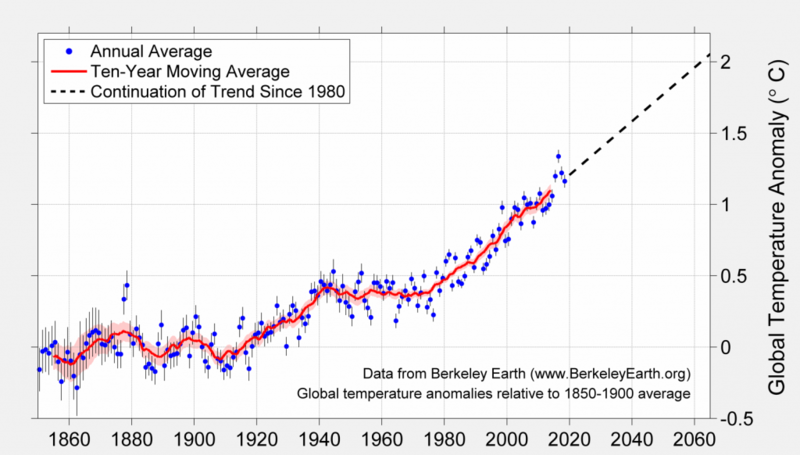 In the analysis that Berkeley Earth conducts, the uncertainty on the mean temperature for recent years is approximately 0.05 °C (0.08 °F). 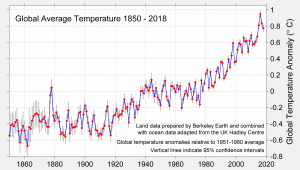 Since 2018 was colder than 2015 by only 0.04 °C (0.06 °F), the ranking of 3rd versus 4th warmest year can reasonably be regarded as ambiguous. Though 2018 only ranks fourth overall, 2015 through 2018 still stand out as a period of significant warmth well above all previous years since 1850. This reflects the long-term trend towards global warming. Though 2018 is slightly cooler than the immediately preceding years, its temperature remains consistent with the long-term warming trend. In addition to long-term warming, individual years are also affected by interannual variations in weather. Both 2015 and 2016 were warmed by an extreme El Niño event that peaked in Nov/Dec of 2015 and was reported by NOAA as essentially tied for the strongest El Niño ever observed. That exceptional El Niño boosted global mean temperatures in 2015 and 2016. By contrast, 2018 began with a weak-to-moderate La Niña event. Such conditions would be expected to have somewhat reduced the global mean temperature in 2018. Internal variability, such as El Niño and La Niña, generate year-to-year variations in temperature that occur in addition to the long-term warming trend. The following map shows the degree to which local temperatures in 2018 have increased relative to the average temperature in 1951-1980. As can be expected from global warming caused by greenhouse gases, the temperature increase over the globe is broadly distributed, affecting nearly all land and ocean areas. In 2018, 85% of the Earth’s surface was significantly warmer than the average temperature during 1951-1980, 13% was of a similar temperature, and only 2.4% was significantly colder. We estimate that 4.3% of the Earth’s surface set a new local record for the warmest annual average. Most significantly in 2018, this included large portions of Europe and the Middle East. 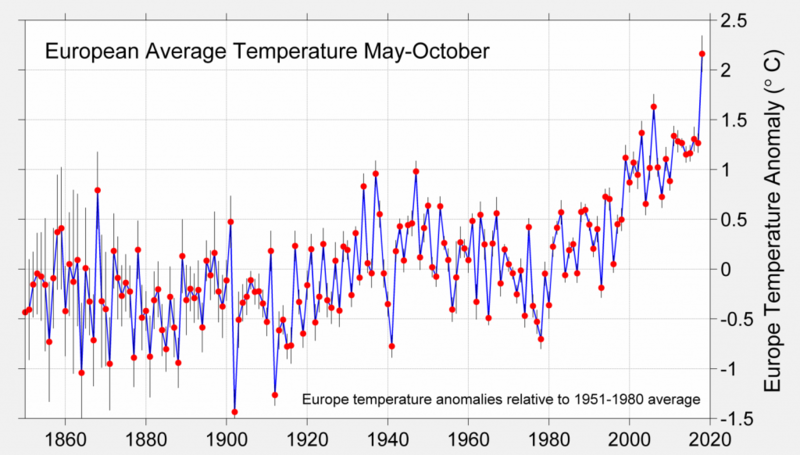 The heatwave which affected Europe in 2018 included by far the warmest May to October average that has been observed since record-keeping began. This long period of unusual summer warmth had a significant impact on the region and was accompanied in many areas by a significant drought. In 2018, no places on Earth experienced a record cold annual average. The following map qualitatively categorizes local temperatures in 2018 based on how different they were from historical averages after accounting for the typical climate variability at each location. In a stable climate only 2.5% of the Earth would be expected to have temperatures “Very High” or higher in any given year. In 2018, 44% of the Earth fell in these categories. Locations with new records for annual average temperature are also indicated. Land areas generally show more than twice as much warming as the ocean. 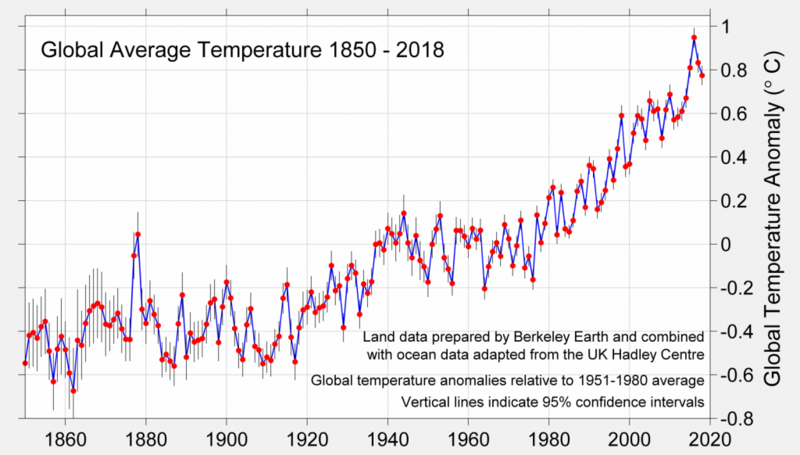 When compared to 1951-1980 averages, the land average in 2018 has increased 1.13 ± 0.05 °C (2.03 ± 0.09 °F) and the ocean surface temperature, excluding sea ice regions, has increased 0.48 ± 0.06 °C (0.86 ± 0.11 °F). 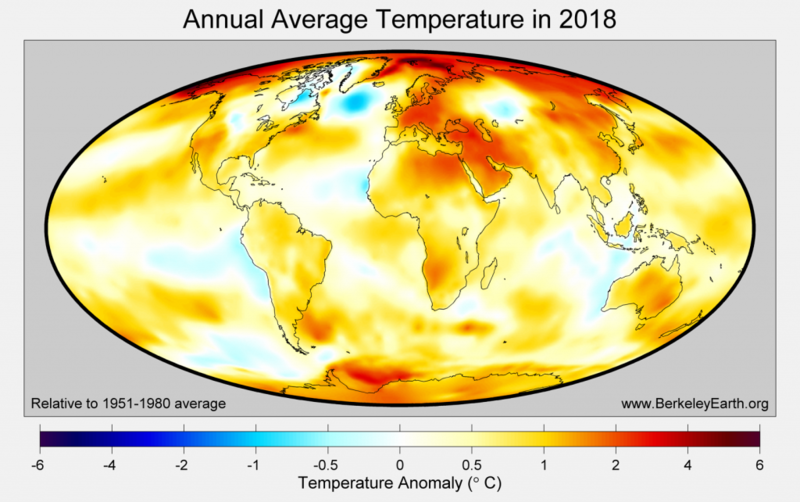 As with the global average, 2018 was the 4th warmest year on land. For the ocean surface, we find that 2018 was the 5th warmest year. We take note of the fact that other groups have announced that 2018 set a new record for total ocean heat content, including both surface and subsurface waters. The following figure shows land and ocean temperature changes relative to the average from 1850 to 1900. The tendency for land averages to increase more quickly than ocean averages is clearly visible. As in other recent years, 2018 also demonstrated very strong warming over the Arctic that significantly exceeds the Earth’s mean rate of warming. This is consistent with the process known as Arctic amplification. By melting sea ice, warming in the Arctic regions causes more sunlight to be absorbed by the ocean, which allows for yet more warming. 2018 was the sixth warmest year in the Arctic. Both the tendency for land to warm faster than ocean and the higher rate of warming over the Arctic are expected based on our understanding of how increases in greenhouse gas concentrations will impact the Earth’s climate. 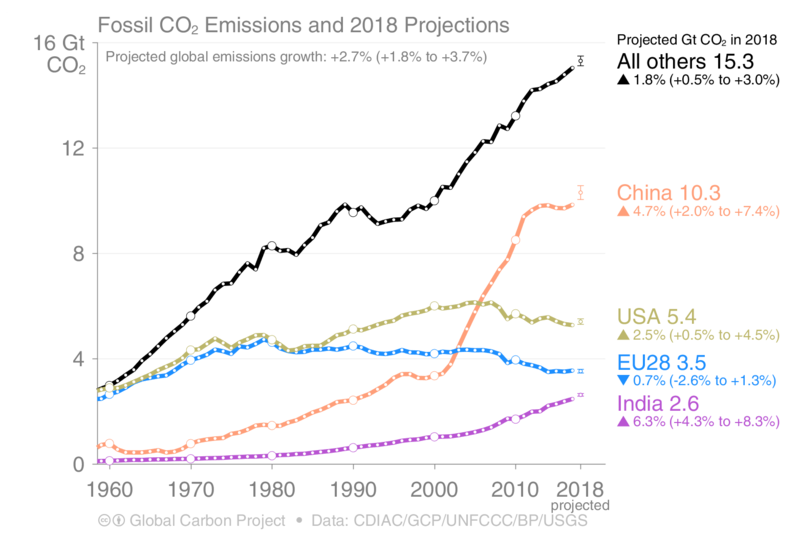 As has been reported by the Global Carbon Project and other observers, 2018 saw new records for both the level of carbon dioxide in the atmosphere and the annual amount of carbon dioxide emitted by human activities. Lastly, we note that the equatorial Eastern Pacific shows a weak cooling pattern in the annual average map. This is reflective of the La Niña conditions occurring in the early part of 2018. Though the focus of our work is on global and regional climate analysis, it is also possible to use our data to estimate national temperature trends. In our estimation, 2018 was the hottest year since instrumental records began in the following 29 countries: Albania, Armenia, Austria, Bahrain, Belgium, Bulgaria, Bosnia and Herzegovina, Croatia, Cyprus, Czechia, France, Germany, Greece, Hungary, Italy, Kosovo, Liechtenstein, Luxembourg, FYR Macedonia, Monaco, Montenegro, Oman, Poland, Qatar, Serbia, San Marino, Slovakia, Switzerland and the United Arab Emirates. 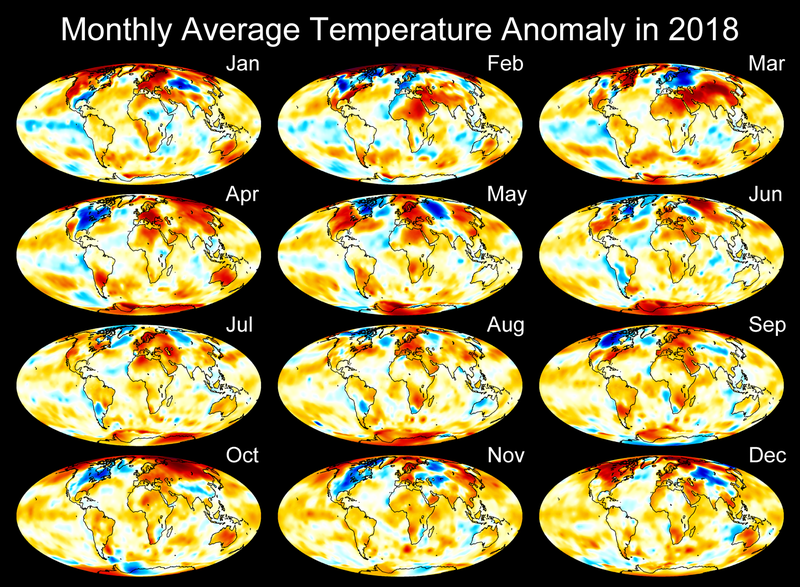 In addition, it was also the warmest year thus far observed in Antarctica. 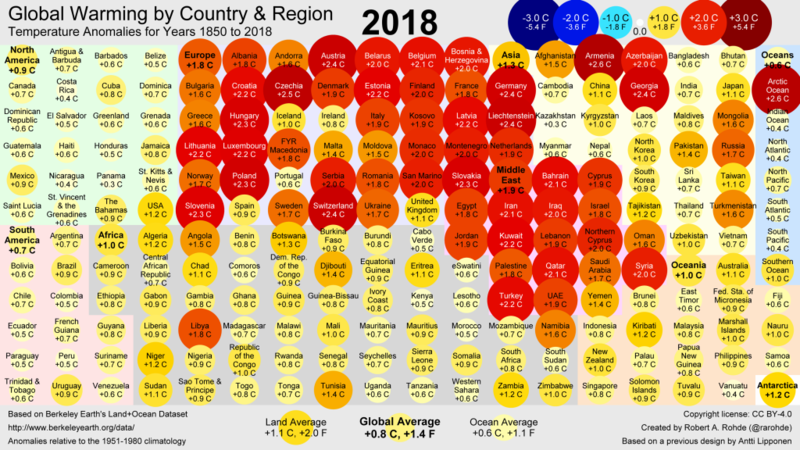 The following chart summarizes the warming that countries experienced in 2018 relative the 1951 to 1980 averages. As mentioned previously, Europe and the Middle East experienced greater warmth in 2018 than most other regions. These estimates for the changes in national annual average temperatures are derived from our global temperature fields. Due to uncertainties in the analysis and the limits of our spatial resolution some national average estimates may differ slightly from the values reported by national weather agencies. Every month in 2018 was at least 0.67 °C warmer than the 1951 to 1980 average, but no month in 2018 set a new monthly record for the globe. In the maps below, the persistent heat anomaly over Europe is visible through the latter portion of the year. A prolonged period of winter warmth in Antarctica is also visible. In the oceans, the weak La Niña pattern is visible in the Eastern Equatorial Pacific during the early months of 2018. Though a transition to weak El Niño conditions had been predicted for the end of 2018, the temperature patterns in the Pacific at the end of the year remain weak and unconsolidated. Though it is interesting to understand the characteristics of individual years, global warming is ultimately about the long-term evolution of Earth’s climate. The following chart shows a ten-year moving average of the Earth’s surface temperature, plotted relative to the average temperature from 1850-1900. Since 1980, the overall trend is +0.19 °C/decade (+0.34 °F/decade) and has changed little during this period. By continuing this trend, we can make a rough guess of how the near-future climate may develop if the forces driving global warming continue at their present rate. 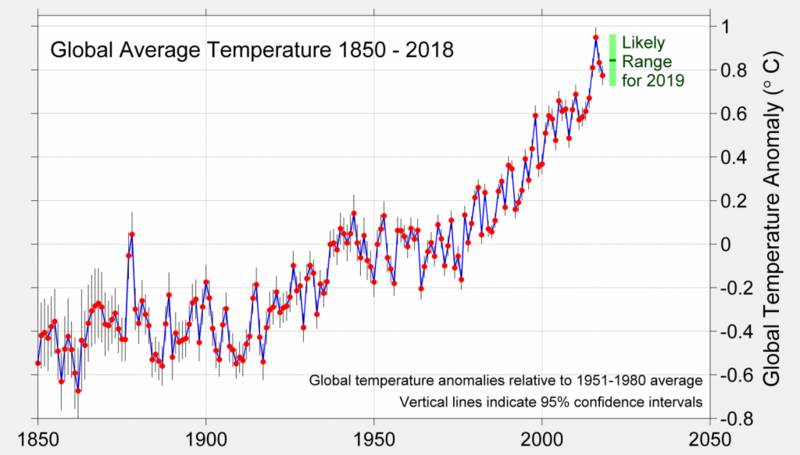 As shown in the chart, several recent years have had temperatures more than 1 °C (1.8 °F) above the average temperature from 1850-1900, often used as an estimate of the pre-industrial climate. The Paris Agreement on Climate Change aims to keep global temperature rise to well below 2 °C (3.6 °F) and encourages parties to strive for warming of no more than 1.5 °C (2.7 °F). At the current rate of progression, the increase in Earth’s long-term average temperature will reach 1.5 °C (2.7 °F) above the 1850-1900 average by 2035 and 2 °C (3.6 °F) will be reached around 2060. 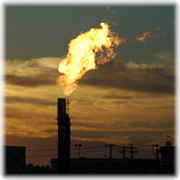 The increasing abundance of greenhouse gases in the atmosphere due to human activities is the direct cause of this recent global warming. If the Paris Agreement’s goal of no more than 1.5 °C (2.7 °F) warming is to be reached, significant progress towards reducing greenhouse gas emissions must be made soon. 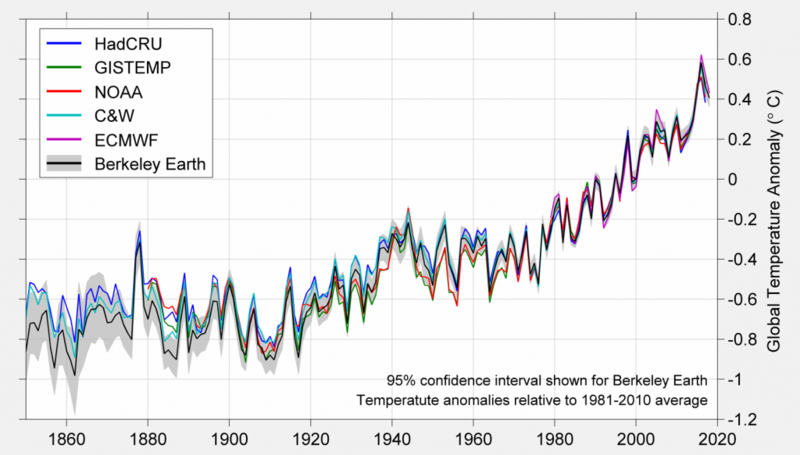 Based on historical variability and current conditions, it is possible to roughly estimate what global mean temperature should be expected in 2019. Our current estimate is that 2019 is likely to be warmer than 2018, but unlikely to be warmer than the current record year, 2016. At present it appears that there is roughly a 50% likelihood that 2019 will become the 2nd warmest year since 1850. This forecast is somewhat lower than the comparable forecasts issued by the UK Met Office and Gavin Schmidt of NASA. Those forecasts were both made somewhat what earlier, before the end of December, and included a greater amount of El Niño related warming than now seems likely. This year is unusual due to the ongoing shutdown of the United States government. The shutdown has prevented NOAA and NASA from doing climate change analysis or presenting their results for 2018. 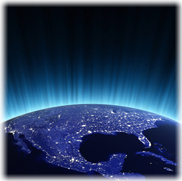 The shutdown has also affected NOAA’s role as a key international depository and distribution point for climate data. Some archives, especially those closely related to weather forecasting, have remained available. However, other resources are off-line or incomplete due to the shutdown. The government shutdown has affected multiple streams of input data that Berkeley Earth uses in our analysis. However, because we often acquire the same or similar data from multiple sources, we ultimately concluded that we had obtained enough data to complete our analysis of December 2018 temperatures. The Hadley Centre of the UK Met Office has been a key partner in this analysis. They provide the ocean data that we interpolate to generate our sea surface temperature fields. Despite initial indications that this might not be possible due to disruptions in the data archives managed by NOAA, the Hadley Centre was able to complete their sea surface temperature analysis (HadSST). 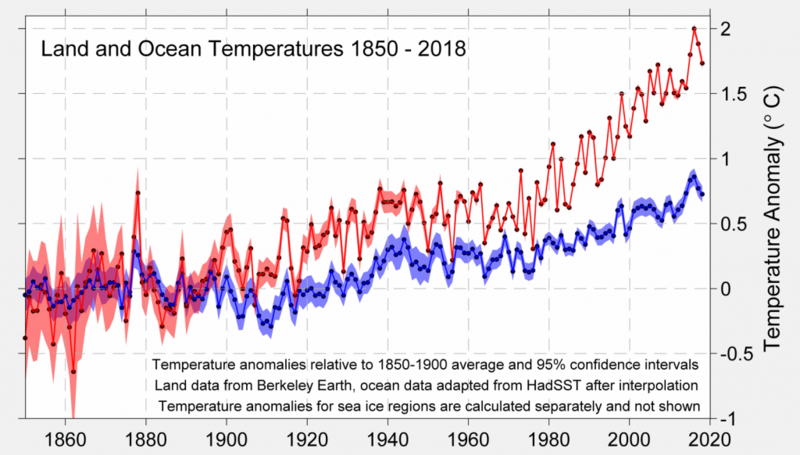 Though their sea surface temperature analysis is available, the UK Met Office’s final report for 2018 has also been delayed by the unavailability of other climate data archives run by NOAA. When preparing our year-end reports, Berkeley Earth traditionally compares our global mean temperature analysis to the results of five other groups that also report global mean surface temperature. Initially, we had planned to join most of the other climate analysis groups with a coordinated release on January 17th; however, that was impossible under current conditions. At present, the global reanalysis project run by the ECMWF is the only other project that has been able to issue their report. ECMWF also concluded that 2018 was the fourth warmest year, though their estimate for 2018 was in a near tie with their 3rd warmest year. Despite the recent disruption, we do have the results of each of the other groups for January through November of 2018. Even without official results for December 2018, the partial year results are such that it is very likely that all six groups will ultimately concur that 2018 was the fourth warmest year. The following chart compares Berkeley Earth’s analysis of global mean temperature to that of the other groups, though only Berkeley Earth and ECWMF data have been updated through 2018. In reconstructing the changes in global mean temperature since 1850, Berkeley Earth has examined 19 million monthly-average temperature observations from 46,000 weather stations. Of these 20,000 stations and 205,000 monthly averages are available for 2018. The weather station data is combined with sea surface temperature data from the UK Met Office’s Hadley Centre (HadSST). This ocean data is based on 374 million measurements collected by ships and buoys, including 19 million observations obtained in 2018. We reprocess and interpolate the HadSST data to provide a more complete picture of the oceans. After combining the ocean data with our land data, we arrive at a global picture of climate change since 1850. Uncertainties arise primarily from the incomplete spatial coverage of historical weather observations, from noise in measurement devices, and from biases introduced due to systematic changes in measurement technologies and methods. The total uncertainty is much less than the long-term changes in climate during the last 150 years. This report is based on such weather observations as had been recorded into global archives as of early January 2018. It is common for additional observations to be added to archives after some delay, an issue that is more likely this year due to the US government shutdown. Consequently, temperature analysis calculations can be subject to revisions as new data becomes available. Such revisions are typically quite small and are considered unlikely to alter the qualitative conclusions presented in this report. This report was prepared by Berkeley Earth. The contents of this report, including all images and the referenced videos, may be reused under the terms of the Creative Commons BY-4.0 copyright license for any purpose and in any forum, consistent with the terms of that license. Members of the news media may also use the materials in this report for any new reporting purpose provided that Berkeley Earth is properly acknowledged, without concern for whether or not the CC BY-4.0 license is followed. Updated data files will appear at our data page, and are updated monthly. In particular, monthly and annual time series are available.